Type species: Tropidonotus sauritus Schlegel, 1827 = Coluber saurita Linnaeus, 1766, by original designation. Type species: Prymnomiodon chalceus Cope, 1861, by original designation and monotypy. Cope, E.D. 1861. Catalogue of the Colubridae in the Museum of the Academy of Natural Sciences of Philadelphia. Part 3. Proceedings of the Academy of Natural Sciences of Philadelphia 12: 553–566. BHL Reference page. Uetz, P. & Hallermann, J. 2019. 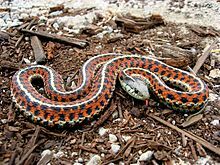 Thamnophis . The Reptile Database. Accessed on 22 May 2018. Эта страница в последний раз была отредактирована 17 марта 2019 в 08:46.